Seamless Transit is the new transportation policy report from SPUR. Main author Ratna Amin proposes integrating the Bay Area’s balkanized transit systems to improve lackluster ridership. Given that the region has 23 separate transit providers–more than any other metropolitan area in the country–she may have a point. The report proposes standardizing service maps, fare structures, and payment systems; eliminating inter-system coverage gaps as well as redundant coverage; and reforming transit governance so that the different agencies actually make plans together instead of working at cross-purposes or not at all. The recommendations are sound and the report includes historical footnotes for context. These are helpful for understanding region’s complicated institutional arrangements. 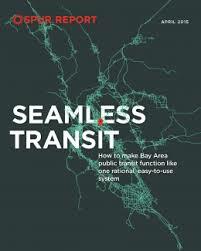 Seamless Transit is a fine piece of work and well worth the read for anyone interested in Bay Area transportation. But while organizational efficiency is important, it’s not the only thing to discuss. If we want to improve the region’s mass transit systems, we have to consider the physical environment in which those systems are embedded. To get transit right, the region needs to embrace density. Denser development around transit nodes would increase ridership substantially. When people live, work, and play in smaller geographic areas, more people travel between a fewer number of points. Mass transit, especially fixed rail transit, becomes more effective the denser development becomes. Hong Kong’s Metro Transit Railway (MTR) might be the quintessential example of urban density begetting mass transit success. The city is home to over 7 million inhabitants. It has a population density of over 18,000 residents per square mile. And of this population, 41% live within a half mile of an MTR station. The result? The MTR has a farebox recovery ratio of 186%–the highest in the world. Because of legal as well as political differences between Hong Kong and the Bay Area, copy/pasting the MTR’s Integrated Rail-Property Development approach probably isn’t feasible. But the general lesson remains the same. Increasing ridership means accepting density. And accepting density means reforming the region’s anti-growth, anti-urban land use policies. None of this is a critique of Ms. Amin or her co-authors. They set out to address a specific set of issues and they did it well. But in the wider conversation about regional transportation, we’d do well to remember the importance of land use. And we’d do well to recognize the necessity of reform. Ultimately, getting mass transit right may have as much to do with embracing urban levels of density as it does with making sure the trains show up on time.